One of the most beloved holidays in America is just around the corner, which means that we should all be getting ready with the last preparations and decorations! Sure, reusing last year’s decorations or simply buying some from the store could work, but nothing compares to the satisfaction you have when you craft your own DIY Fourth of July decorations. Let’s have a look at some ideas that are interesting and easy to put into practice! 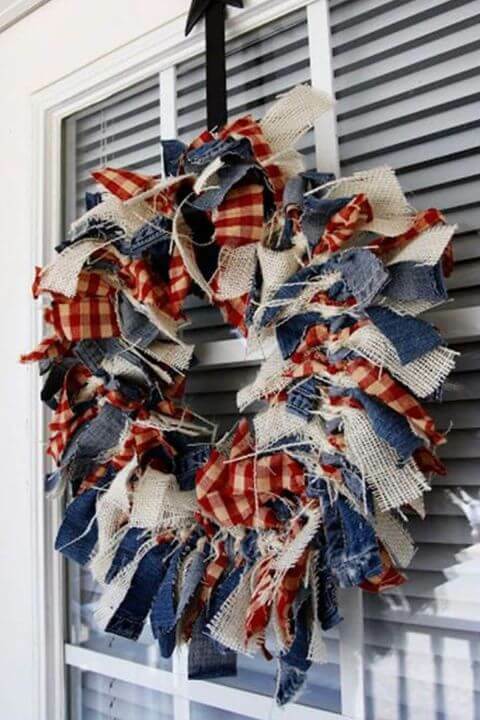 Anything you would like to add to customize the patriotic wreath. Trim the pinwheels – this is not compulsory, but if you want to make them smaller, now it’s the time to trim them. You can take a few folds and cut around it so that you will shorten the diameter. You can even cut some patterns out of it! Add cardboard – with the help of the hot glue, use a small piece of cardboard and fix it on the back of the pinwheel, so that you will have a flat surface where to stick the wreath. Extra fireworks – take the printed popsicle sticks and make some extra “fireworks” with them. For example, you can criss-cross them on top of each other and the use the hot glue to keep them together. Finish up the wreath – put the pinwheels and the popsicle stick fireworks around the wreath form you already have until you reach the layout you want. Make them stay in place with a generous amount of hot glue and then use whatever decorations you want: ribbons, stars, glitter etc. The limit is only your imagination! When you’re done, you can hang the wreath (or various of them) all over your backyard. The effect will truly be impressive and your friends might even get jealous on your crafting skills! They might even help you with some other DIY Fourth of July decorations which you can craft together. Balloons – choose red, blue and white ones and don’t limit yourself on the number. The more, the merrier! Submersible tea lights – you can find such lights on Amazon or at The Dollar Store. They are battery operated and they are quite cheap. Make sure you get the right type, since there are also non-submersible ones, which work for the garden, but not for the pool. Turn on the tea lights. Stretch each balloon and pop one tea light into each one. Blow up the balloon as much as you want. If you don’t fill it to the maximum, then you will have a rounder, less oblong shape. Make sure that the tea light is facing up. For this, you may need to shake the balloon or tilt it. The best part is that the orbs do have some weight, so they will stay right side up, while the tied end of the balloon remains underwater. Now you can simply place the orbs wherever you want! Spread them throughout the backyard to create a magical patriotic atmosphere or place them in the pool. Patriotic flower pots are a great DIY Fourth of July decorations idea! Besides bringing a patriotic look and feel, they are also quite old school and will have a personal touch if you do them yourself. Let’s see what you need to make your own creative flower pots! Chalky paint colors – it is recommended to choose red, white and blue ones for the Fourth of July, but generally you can experiment and get creative with other colors as well. ¼” vinyl lettering stars (or just regular stickers). Here are the steps you need to follow in order to get your own DIY flower pots. Paint the entire pot white. When it is dry, you should add painters tape. Start at the top and work your way downwards until you reach the bottom. There isn’t really a complicated technique to this, you just have to slap the tape on and push it to the bottom. It might indeed leak, but don’t worry about that since you can sand it later. Then, paint the two lines: white on top, middle and bottom. Take the stars and add them around the rim of the top, then use the blue paint there. When they’re dry, take out the stars and you will see a nice interesting pattern there. Lastly, you can also use a fast-drying sealer if you want to get the job done faster. All you must do is to plant some flowers in them or move the ones you have already grown into different pots. Enjoy one of the most creative DIY Fourth of July decorations idea out there! Cardboard – you can use some old cardboard, it can be already painted or written on, it doesn’t matter. Construction marking spray paint – choose red, white, and blue colors in order to give it a patriotic feel. Otherwise, you can also go for various colors if you want to get more creative. Draw a star on the cardboard. It is up to you to choose the size, but it would be a good idea to go for a bigger one. If you can’t draw it on your own, you can use some cheating techniques: draw a huge circle first and then use it to figure out the star, or simply print the pattern you download online. Use the spray paint to draw the stars on the grass. Here, you can choose to have solid color stars or simply use the outline. For the fully colored ones, use the big cardboard from where you cut the stars stencil, while for the empty ones, you can use the star that was cut from there. Now your garden or backyard will be customized and more interesting. You will surely impress your guests and maintain an even more patriotic feel to the party, if that’s possible. Alternatively, you can use the stencil to draw on the walls as well, if you’re willing to do that sacrifice, which might give birth to some more DIY Fourth of July decorations for next year’s party. 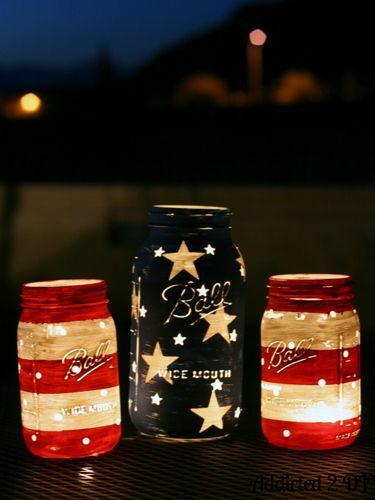 The last DIY Fourth of July decorations idea we would like to present you today is the Mason jar lanterns. Most people love Mason jars and try to use them as much as possible in such projects, and if you’re a DIY fan, you might want to give this idea a shot as well. Moreover, the chalky finish paint is more than appropriate for a backyard idea, so why not put them together? One half gallon and two quart-sized jars – choose as many as you want and think about how much light you want to bring to your backyard. Vinyl stars – if you have some leftover vinyl, you can use it to cut out dots and stars out of it. You can try a size of ¼” for dots and ½” for the stars. Chalky finish paint – needless to say, you should choose red, white and blue paint to keep the patriotic feel to it. Paint the jars with the white color. Place the dots you cut out on the jar. Place the painters tape horizontally on the jars. Take out the dots and you will see the pattern that is left behind. Place the stars on the jar. Remove the stars to reveal the pattern. After the paint is dry, sand the jars with the 220-grit sandpaper so that they will have a smooth finish. Stick the tea lights into them and enjoy it! Of course, there are plenty of other DIY Fourth of July decorations ideas which you can use to step up your celebration party, but the main thing here is to take advantage of your creativity and to use the main colors!